Filmmaker Lorna Green Charged with developing an urban, professional image for filmmaker Lorna Green, Eat Mo's started from scratch, taking photos and creating a bio and resume for the award- winning writer/director. 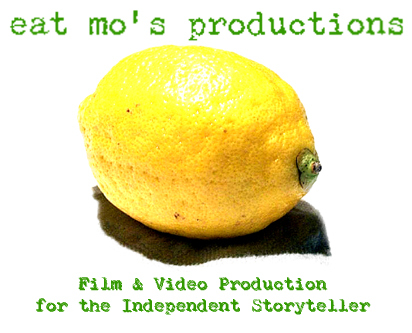 Employing the additional talent of digital artist Alexia Moore, Eat Mo's succeeded in creating this professional web-based calling card, that includes a digitally streamed reel of the filmmaker's work. As part of an overall marketing strategy for this feature-length screenplay, Eat Mo's puchased the domain name and developed this website to give vision and depth to the writer's vision. Photographer Peggy Moore created black and white photos under the filmmaker's direction. Eat Mo's digitalized these images and used them to optimize the story telling aspect of the website. Also available is a real-world postcard used as a query to interested producers. WWWilliamsburg - A Virtual Colonial Experience What do you do with hundreds of photos of Colonial Williamsburg? Twenty-four Oakland teachers returned from their nine-day American History intensive in Wiliamsburg, Virginia, and wondered just that. Eat Mo's designed this curriculum- rich, easily navigated site so students throughout the school district could benefit from the teachers' trip. The photos are organized to encourage student inquiry in the colonial period and to allow the photos' use as primary sources in student research. This all volunteer organization needed a user-friendly website to be a resource for thousands of students and teachers statewide. Volunteers had left a patchwork site static for months. Eat Mo's completely redesigned the existing site, and developed a way to easily update the site with new information on a regular basis. As a student in Johnny Otis's Music Class (offered by Vista College in Berkeley, California) Eat Mo's developed this website as a way for students to check in and communicate. Lots of people visit the site for Johnny's Red Beans & Rice recipe. Go figure. For more teaching and student websites, click this link.